“SPORT MOVIES & TV 2019 – 37th Milano International FICTS Fest” (www.sportmoviestv.com) Final of 16 Festivals (around the 5 Continents) of the “World FICTS Challenge” World Championship of Television, Cinema, Communication and Sport Culture will be held in MILANO (ITALY) FROM 25TH TO 30TH OCTOBER 2019. The event – through “FICTS is Culture through sport” slogan – is organized by FICTS – Federation Internationale Cinema Television Sportifs, joined with 116 Countries (chaired by Prof. Franco Ascani Member of “IOC Commission for Culture and Olympic Heritage”) and recognized by the International Olympic Committee for which it promotes the values of sport through footages.The event is a considerable “world showcase” for Networks, media, broadcastings, houses of productions, producers, directors, filmmakers, Olympic Committees, advertising and integrated communication agencies, that will show the whole universe of cinema and sport television through spot, reportages, fiction, cartoon, etc. There are 7 competitive Sections: 1) Olympic Spirit; 2) Documentary; 3) Sport & Disability; 4) Sport & Society; 5) Movies; 6) Movies & Tv Football; 7) Tv and weblog. 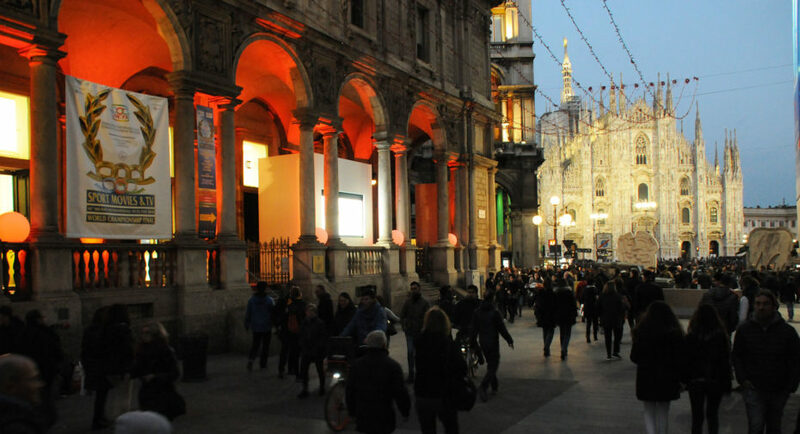 The seventeenth century Palazzo Giureconsulti, in the hearth of Milano (Piazza Mercanti, 2 – Piazza DUOMO) will be the “Core business” of the event articulated into Projections (worldwide and European premieres, etc. in 6 points of projections), Meetings, Workshop, Exhibitions, Press Conference, Awards of National and International guests, Side Events. The Official Rules are available on www.fictsfederation.it/rules_spmtv2019.pdf. The Entry form is available on http://www.fictsfederation.it/festivalform.doc. The International Jury, composed by 7 exponents of cinema, television, media, sport and culture coming from Countries that don’t participate in the Festival, will assign for each 7 Sections, the “Guirlande d’Honneur” the “Oscar of Cinema and Sport Television”, the “Mention d’Honneur” as well as the “Special Prize” (among which “Super Award” in money of € 5.000 assigned to “The best production among all the Section”). All the productions Selected to the Festival, besides screened, will be shown with own profile in the official Catalogue of the Festival as well as on the FICTS website. Sylvester Stallone, star and director of some film, will be awarded with the “Excellence Guirlande d’Honneur” at “Sport Movies & Tv 2019”. On the occasion of the theatrical release in Italy of the last film “Creed II”, the eighth episode of the saga belonging to the Rocky Balboa’s myth, FICTS opened the poll “Which of the 8 films of the Rocky saga do you prefer? : from “Rocky” (1976) directed by John G. Avildsen (three “Oscar” awards) to “Creed II” (2018) directed by Steven Caple Jr. To vote, just click on the title of the favorite movie at the link http://www.sportmoviestv.com/2019/01/23/sondaggio-ficts-quali-tra-questi-film-della-saga-rocky-preferisci.